The Los Angeles County Sheriff's Department will host a Civilian Community Academy for people that live or work in the city of Carson. The academy is an excellent opportunity for the Sheriff's Department to allow people in the community to have a better understanding of the operations of the department. All applicants will be subject to a background check. 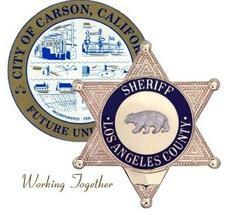 Applications may be picked up at Carson Sheriff's Station in the Community Relations Office. All applications must be received by Thursday, February 28, 2019. Space is limited! For more information of any questions please contact Sergeant Veramendi, Deputy Valdez, or Deputy Noya at (310) 847-8386.